In the weeks before his death, Michael Graves gave one of his last interviews to Princeton Magazine for the article that is printed here as written, with some modifications. He was still reporting to work every day, painting, making travel plans, seeking new building projects and looking forward to another year of teaching. In this world there are numerous entities titled Michael Graves. There’s the Hotel Michael in Singapore, a luxury facility named for and featuring everything designed by the Princeton-based architect. 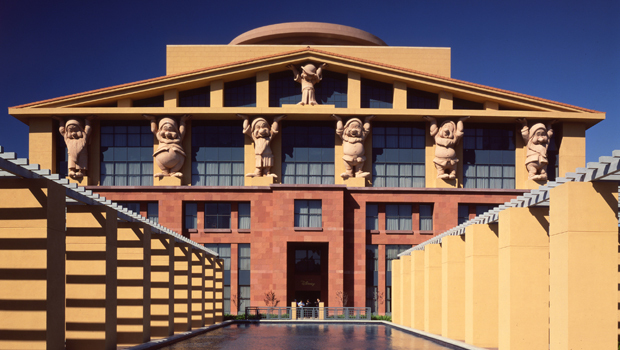 The rooms are a sort of Michael Graves catalog, filled with his hallmark shapes that evoke roots in classical architecture. Even the paintings and murals come from the hand of Graves. There is the AIA-NJ Michael Graves Lifetime Achievement Award—“the highest and most prestigious honor that AIA New Jersey can bestow.” Graves himself was the first recipient, in 2004, and Princeton architect and Graves colleague J. Robert Hillier was the second recipient, in 2008. Then, of course, there’s the architect himself, winner of so many architectural awards he could design a library to hold them all. Highlights include the 2012 Richard H. Driehaus Prize and the 1999 National Medal of Arts from President Bill Clinton. In 2001, the American Institute of Architects awarded Graves its Gold Medal, the highest award bestowed upon an individual architect. In January, Graves received the AIA Presidential Citation. About three years ago Graves moved his offices from the south side of Nassau Street to the north side, in a space that served as a store for his product designs more than a decade ago. The conference room is lined with his teakettles, espresso sets and toasters polished to such a high luster they reflect their surroundings, and dollhouse-size models of his chairs. The full-size versions can be seen in the Paul Robeson Center for the Arts, his design for the Arts Council of Princeton, and in MarketFair, where he redesigned the interior about five years ago. As a visitor perused these artifacts, Graves made his entrance. He always was an impeccable dresser, often wearing a cashmere sweater; in photo shoots, another sweater can be seen draped stylishly around his neck. “He came into the office dressed like that everyday,” says his assistant, Mary Kate Murray. Graves was now fully visible in the entrance. With one hand on the lever that operates his wheelchair, he reached with the other to shake the hand of his guest. This was his C 500, the wheelchair he used for work—it has a tray table. On weekends, or when exercising or painting, he used his iBOT. This is the same wheelchair used by Graves’s friend, the artist Chuck Close. The occupant of the iBOT can be raised or lowered, to meet the eye level of the company he is in. Even more spectacularly, the wheelchair can go up and down stairs and over rugged terrain. Developed by Segway creator Dean Kamen, the iBOT—initially priced at $22,000—gives the user mobility and independence and the chance to live with dignity and confidence. Paralyzed from the waist down since a 2003 viral infection, Graves was adept with his iBOT, backing it up to his motorized stationary bicycle, spinning his legs to keep the circulation going. Sadly, Medicare stopped paying for iBOTs in 2006, considering it more a transportation device than a medical necessity, and in 2009 Johnson & Johnson stopped manufacturing the iBOT, Graves reported glumly. Although he designed neither of his wheelchairs, Graves did design the Stryker, a transfer chair used by hospitals to wheel patients from one room to another. “Most of the chairs hospitals are still using were designed in 1933,” says Graves, whose Stryker chair offers greater comfort to the patient. Through insight gained from his own experiences, Graves designed a line of products for the patient room, thought out from a patient’s perspective. In 2013, President Obama appointed Graves to the U.S. Access Board. “There’s a way out of most dilemmas if there’s enough money,” he says. “Getting the money is always a challenge.” Graves airs his frustrations with those in Congress who favor tax advantages for the very rich. Politics aside, he was invited to dinner at the White House during the administrations of Reagan, both Bushes and Clinton numerous times. When in Washington for meetings, he would visit the William Bryant Annex of the Federal Court House, with its giant rotunda, or the Department of Transportation, spanning two city blocks, both of which he designed, or the St. Coletta School for children with multiple disabilities, where he designed small enclosures, like little houses, so the students could recognize their classrooms. Each structure of the 99,000-square-foot school looks like a toy block. At home in Princeton, there are fewer of his buildings to visit. On weekend outings, Graves would pass by the Paul Robeson Center for the Arts, or when traveling on the turnpike he might see the Environmental Center near exit 14. Not far away is a chapel he designed in Newark, and the addition to the Newark Museum, where he was often invited to fundraising functions. He designed a handful of private homes in Princeton early in his career, and had been renovating an addition he put on a Tudor house built in 1970, when it won an AIA Gold Medal honor award. If there’s a refrain that runs through all his work, it is humanism. “Whether it’s a spatula you hold in your hand or rooms for your occupation in a building, it’s the participant, or the user, who comes first,” says Graves. “Not technology or the computer, politics or sociology. Some architects base their work on the metaphor of the machine, but all our metaphors are based on the human being. The subject as well as author of many books, Graves has just released Inspiration and Process in Architecture (Moleskine, 2015). The book divides architectural design into three distinctive moments: referential sketches, preparatory studies, and final drawing. “This book is a visual diary that shows the architect’s attention to the legacy of the past and how the observation of the world leads to the creation of new forms with tangible features,” says the jacket copy. Through April 12, Graves is the subject of a major exhibition at Grounds For Sculpture, celebrating the 50th anniversary of his firm’s work. Michael Graves: Past as Prologue features architecture and product design, from Denver Central Library and the Team Disney Building in Burbank to the celebrated Alessi tea kettle and a collection of bowls and vases for Steuben Glass, as well as paintings, drawings and sculpture. At 80, Graves was still running his practice, still actively seeking new buildings to design. A dream had been to design a building on the Princeton campus. A University policy prevented him from doing so until 2001, when he was Robert Schirmer Professor of Architecture. Asked about his painting: “I paint on Fridays, Saturdays and Sundays. I can’t afford to retire. I’m not wealthy.” Asked about teaching: “It’s crucial that students understand what architecture is from someone like me. You have to believe you’ve got something to say, and if you do you act on it.” Many of his students have become deans of schools of architecture. Since retiring from Princeton he has been a visiting critic at Miami University, although this year the school lacked the funding to bring him back. 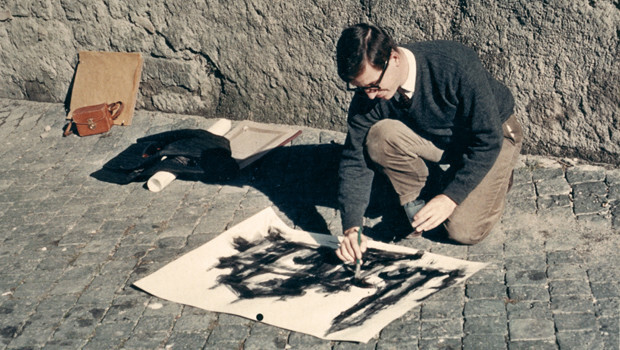 After earning a master’s degree in architecture from Harvard Graduate School of Design in 1959, Graves was awarded the prestigious Prix de Rome to study at the American Academy in Rome. He learned to use his drawing to understand Renaissance and Baroque architecture, and the character and proportion of the buildings. One thousand of these line and wash drawings were published in Michael Graves: Images of a Grand Tour.